A lot of people think that their mountain bike is all they need before they hit the trail. It is true that your MTB is your best companion. Nevertheless, you need to be properly equipped before exploring rough terrains. This will include packing the right accessories and dressing right for the occasion. What Should You Wear When You Are On Your MTB? When you are getting ready to hit challenging trails, you need to make sure that comfort and safety comes first. You shouldn’t worry that much about the brand name or the price tag. You can find a lot of high-quality and appropriate options that are budget friendly. The helmet is a deal breaker. If you are not wearing your helmet, then you should probably stay home. A helmet is a necessity no matter how smooth you think the trail is, and regardless the level of your experience. Pick a sturdy helmet that fits comfortably. Most of the best models have adjustment straps that allow you to get the best fit. You should be able to talk and drink comfortably without taking your helmet off. It is not meant to suffocate you. Nevertheless, it shouldn’t be loose enough to fall forward or backward while you are cycling or even on your scooter. Wide clothing can get in the way while you are pedaling. This can be life-threatening. As a result, you might fall off or hurt yourself just because you are not wearing the right size. At the same time, tight clothing can be too restricting. 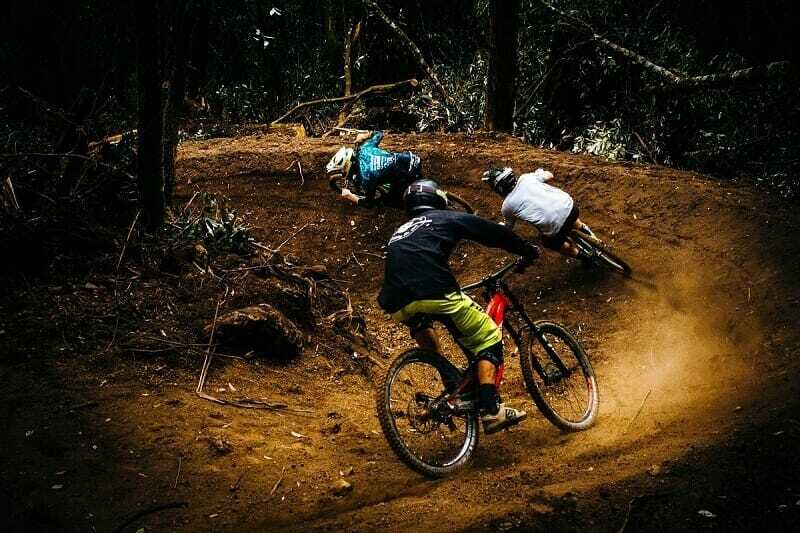 Mountain biking is a tough activity where you will probably burn a few calories. You want to feel comfortable and be able to move all your body parts without restrictions. You might need to reach out for your water bottle, or want to check your GPS. Your clothes shouldn’t get in the way. Are you mountain biking while it is scorching hot? Is it raining? Make sure that your clothes are appropriate for the weather. Look for natural fibers that will not cause any skin rashes. It is always good to look for breathable material that will let the air in. Like the best hunting pants, can are being put on while anyone is going out for hunting. You also required wearing the right cloth while going out with your mountain bike. The right pants will protect your legs in case you fall off your bike. Remember that you are not going on a smooth path. Hitting a stone or an obstacle can happen. Shorts are not as protective in that case. Your pants will not restrict you or make you feel hot. Make sure that you pick a breathable and durable material that will endure the rough conditions. Some models will feature some padding in the knee area for further protection. Picking the right fit will allow you to move and pedal comfortably. If you are unable to move your legs freely, then you should probably go a size up. You might go for thermals under the pants to feel warm. The same applies for the top you are wearing. It is not always the best idea to wear sleeveless shirts, exposing large areas of your body to the sun. Even if it is hot, a good t-shirt made of breathable material will be more practical. Don’t forget your sunscreen to add the most important layer of protection. When it is cold, it is better to go for layers rather than bulky clothes. Bulky clothes can be too restricting when you are on your bike. Layers, on the other hand, will keep you warm enough to go on your adventure. There are a few accessories that can make all the difference. Your polarized sunglasses, for example. The right shades will reduce the glare that causes eye fatigue and discomfort when you are mountain biking. They will also protect your vision from the UV rays that can cause permanent damage. Your tactical gloves are essential to help you have a better grip. They also protect the delicate skin on your hands and prevent the formation of ulcers and wounds especially after spending a long day on your MTB. There are full or cut off models available on the market. You can give both a try to find what works best. Paying attention to these details will guarantee the success of your MTB adventure. The best gear shouldn’t cost the most. It is all about planning ahead. Knowing where and when you’ll hit the trail will allow you to be properly prepared. You can always update your gear until you end up with the right outfit, ready for the next adventure.